Can I have a dosa? 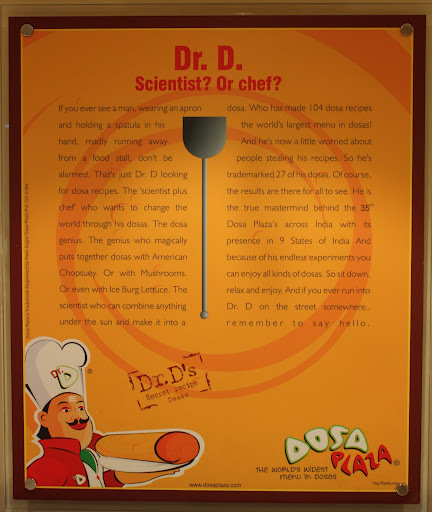 This isn’t the right question to ask when you are at Dosa Plaza. As the name suggests, the place is a home to dosas. When I say home, I literally mean it as these guys have about 100 varieties of dosas. With so many offerings, you shall be spoilt for choice. 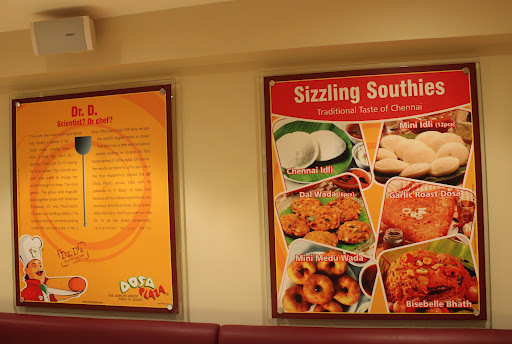 Dosa Plaza is an Indian franchise running for over 13 years and has about 40 outlets in 12 states of India, about 3 outlets in New Zealand and 2 outlets in UAE (don’t miss the catch at the end of the review). It was around midnight when me and my friend entered the restaurant. We had to rush in order to ensure that we got enough time to enjoy the food, before Dosa Plaza closed for the day. The waiter was kind enough to point out some of the best dosas on the menu. This helped our cause and we were ready to place our order in less than 5 minutes. 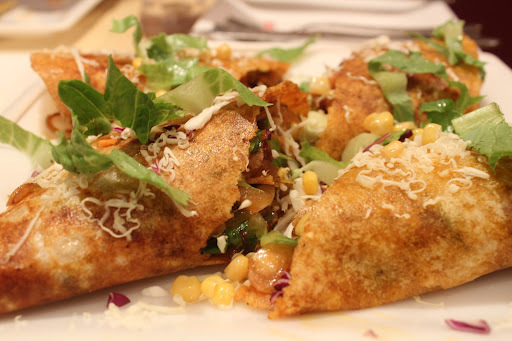 Our order included a Mushroom Chopsuey Dosa with Cheese and a Paneer Corn Crispy Dosa. My friend pointed out that he wanted to try one of the milkshakes as well. He was pretty sure that the Butterscotch milkshake would be amazing. No arguments from my side meant a milkshake for each one of us. Within minutes our first dosa – Mushroom Chopsuey Dosa was on the table along with the Butterscotch milkshakes. 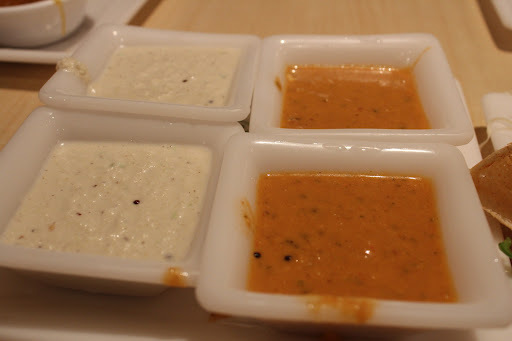 The dosa was served with sambhar and 2 types of chutneys – coconut chutney (white coloured) and the tomato chutney (red coloured). The dosa was neatly cut into 3 pieces, making it easy to eat. The dosa was crispy, right amount of veggies, right balance of spices. The coconut chutney became an instant hit. It made the dosa more delicious. 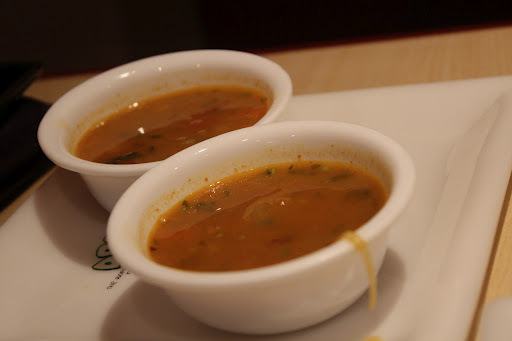 The sambhar was too good, so was the tomato chutney. As my friend had pointed out earlier, the Butterscotch Milkshake was indeed good. It was smooth, not too thick, had just the correct amount of sweetness. Overall it was the right choice. I couldn’t resist ordering another one. We weren’t even done with the first dosa, when the second dosa arrived. The Paneer Corn Crispy dosa was cut into 4 pieces and was much darker in colour, suggesting that it had been cooked using a bit more oil. Talking about taste, this dosa tasted good as well. 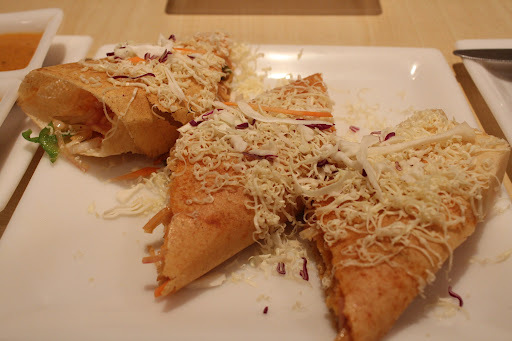 It had a totally different flavour as compared to the Mushroom Chopsuey Dosa. The dosa size and stuffing ensured that we didn’t have any space left in our tummies. Please note that if you are health conscious and don’t want to add another inch to that belly, remember this dosa is tasty, yes very tasty but oily as well. We had just finished eating and our check was already there, however none of us had ordered for the same. We knew it was about time to shut down and the waiter wanted us to move out as soon as possible without saying anything to us. 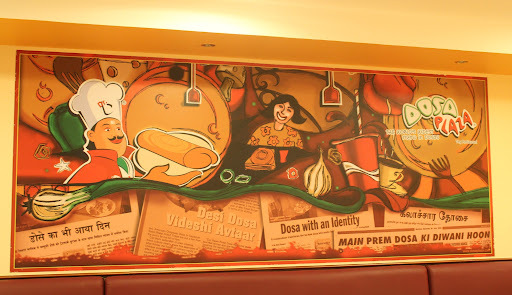 The restaurant sitting and ambience is similar to that of other restaurants like Bombay Chowpatty or Bikanerwala. This means it has a desi feel to it and the décor is nothing fancy. The dosas are tasty but not all that cheap when you compare it to other South Indian restaurants. It is one of those places where you can go with friends and/or family to have some fun and good vegetarian food. For all food lovers in Dubai who feel Al Nahda is too far, Dosa Plaza has a branch opening in Karama (near Pizza Hut) real soon. A special mention to my Veggie friend, without whom I wouldn’t have discovered this awesome Dosa place, Thanks. Thank you Nikhil 🙂 You must try it. Once you do, let me know how it was.